some very important classroom procedures? Classroom routines and procedures are essential for a successful classroom. 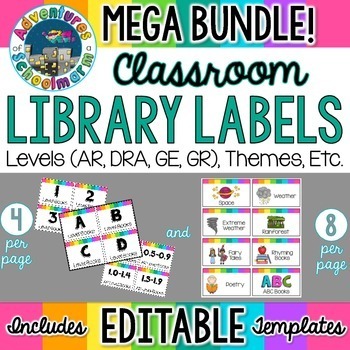 They help your classroom run efficiently so you can maximize student learning. However, as a new teacher, determining routines and procedures can be incredibly overwhelming because there are so many different ones to think about! This post is designed to keep you from overlooking routines that you didn't even know you needed. As we continue our series specifically for new(er) teachers, Tonja and I want to share 10 Classroom Routines that you may have overlooked! 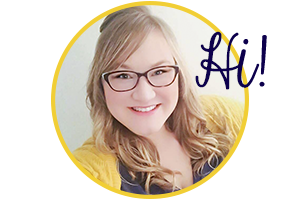 I will be sharing 5 specific things here, and Tonja will share 5 more on her blog, so make sure you click through to read all 10. 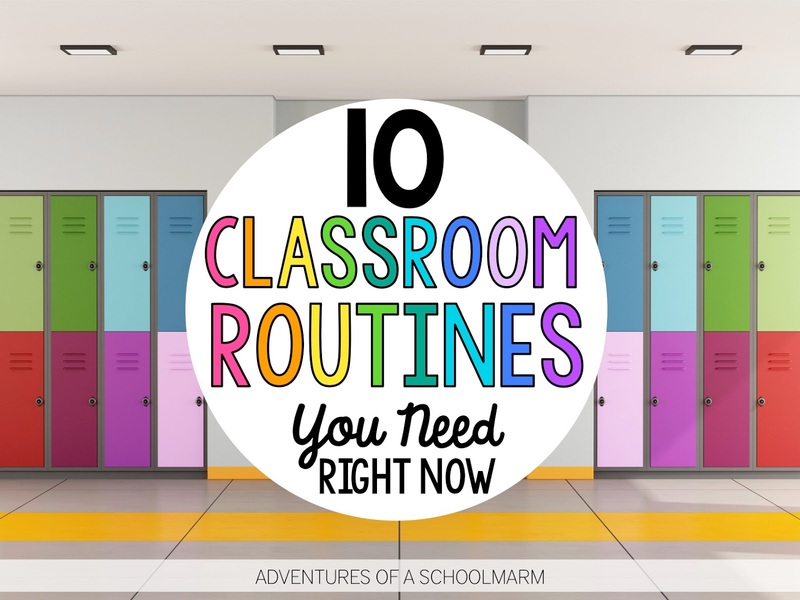 We are confident that thinking through these 10 Classroom Routines will help your classroom run more smoothly this year! First things first. Routines are a NECESSITY. They need to be carefully planned in advance and broken down into clear, specific steps that students can follow. You will need to explicitly model these procedures to your students and give them ample opportunities to practice. If students are displaying undesired behaviors while you are teaching the procedure, take a step back to revisit the directions so students understand exactly what is expected of them. When it comes to procedures, consistent practice and implementation is the key to success! But how exactly do you design an effective classroom procedure? New teachers often feel like this is easier said than done. Effective teachers often make these routines seem effortless, when in reality, they probably took a lot of trial and error. Try using the strategies below to design your procedures. They have helped me for many years! Take time to VISUALIZE your ideal school day. It is very important to visualize how you want things to go so you can design the routines you need to make that happen. For example, before designing your morning routine, ask yourself, "What does the first 10 minutes ideally look like in my classroom?" Perhaps Mrs. Smith wants an extremely quiet classroom where students hang up their bags, go straight to their seats, and begin working productively on an assignment. In contrast, I like to have students engaged in meaningful exploration and practice while talking productively with their peers. Mrs. Smith and I will design very different classroom procedures based on our own ideals. Neither one is more correct than the other - they are a matter of preference. But our vision will determine the routine we need. Work backwards to DESIGN ROUTINES that will make your vision a reality. Once you know what each situation looks like ideally in your classroom, create the routine to make that vision a reality. Think about the process step by step. Break it down as fully as possible so students will know exactly what you expect. WRITE the steps down and REHEARSE. Write each step down. If you are able, practice the routine with a friend. Ask the friend to follow your directions literally without making assumptions. (Never assume kids know what you want them to do.) This will help you troubleshoot any areas that need revised before teaching them to students. If you are unable to do this, I promise you will figure out the things that need revised while you are teaching them! That's ok. Teaching is one big experiment! We all make lots of mistakes, but it is how we respond to those mistakes that sets us up for success. Just write good notes, revise, and improve the procedure for the next day. REFER to your Written Procedures. Elementary teachers need a lot of procedures. There is no way you will be able to remember every little detail of your plan with so many other things swirling through your mind. Keep your written procedures with you. Refer to them when you are teaching them. Make notes if you need to make revisions. I do this even as a veteran teacher because I can't remember everything either! Accept that this is an INVESTMENT of your time. Procedures take time to learn and perfect. 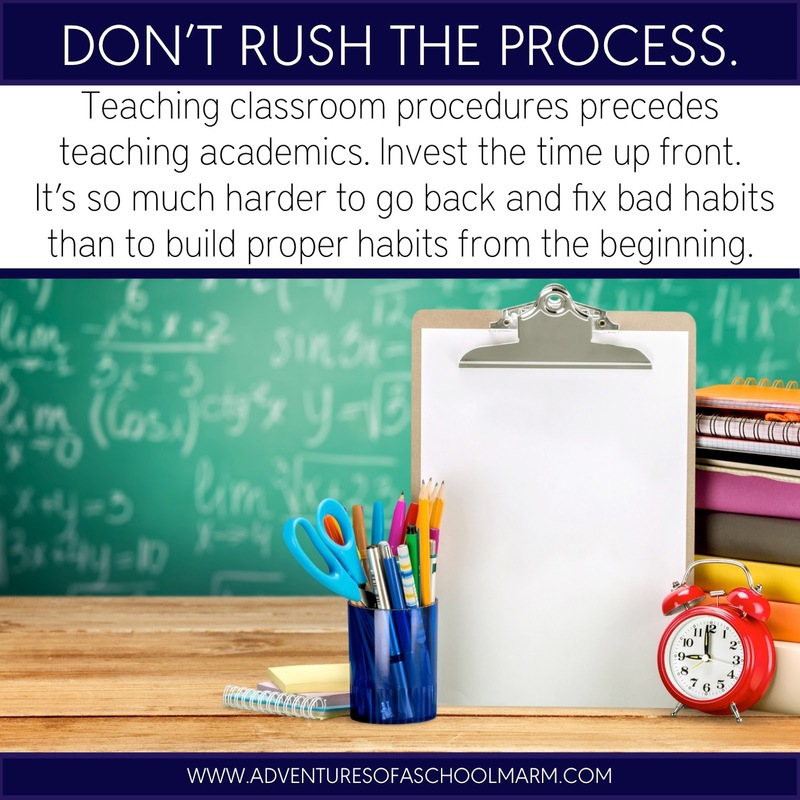 Every moment that you spend teaching, modeling, and practicing procedures with your class is time invested. It is never time wasted. I promise you will get this time back in the future. Whatever you do, don't rush the process just to get to the academics. It is SO much harder to go back and fix bad habits with students than it is to build the proper habits to begin with! You are going to need to have procedures in place for these different types of interruptions. Follow the steps above to ensure that you have thought through the different possibilities. For example, if a curriculum coach or mentor stops by your classroom to ask you a quick question (which often results in several minutes of conversation), what will your students ideally be doing? I imagine it is NOT part of your ideal vision for students to come up and interrupt your conversation with the adult - and yet, I promise, they will. If you have a procedure in place where they are expected to remain in their seats working quietly or ask a neighbor for help, then reinforce that procedure if they break it. Remember that you do not want to inadvertently reinforce undesired behaviors, so consistency is key. Transitions are another source of classroom stress, but planning ahead will save a lot of headaches. These transitions may include: transitioning from one activity to another while staying in the same location, transitioning from one part of the classroom to another such as moving from the class meeting area back to their desks, leaving their desks to come to the class meeting area, transitioning to leave the classroom, and transitioning from the hallway back into the classroom. There are so many creative ways to transition your students that I will devote an entire blog post to this in the future. For now, I will share a few of the tips that I use to have my students transition successfully. Transitioning from their Desks to the Class Meeting Area: In my classroom, the class meeting area is a carpeted space near the front board. It is near all our posted learning targets and my anchor chart station. 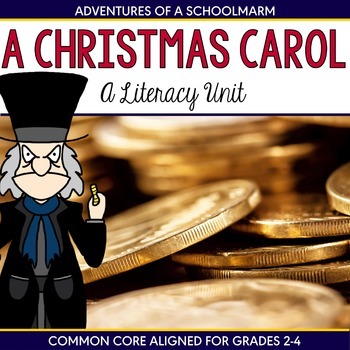 I have seen other teachers use songs or rhymes to help students transition to the carpet area. The song or rhymes often includes specific directions within the lyrics. My 3rd graders are able to do this without a rhyme, but we do practice the expectations of gathering all their supplies (based on my directions), walking directly to the carpet, and sitting down legs crossed with their materials in their lap or on the floor in front of them. Before I begin the lesson, I politely request to the class, "Show me you are ready to learn." 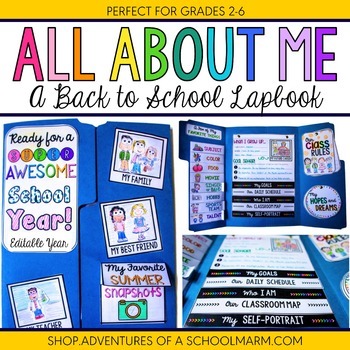 We spend time at the beginning of the year talking about what it LOOKS and SOUNDS like when a student is ready to learn, including making an anchor chart together that we can revisit during the year when they forget. (And they will forget.) At the beginning of the year, I have to be very structured about how I do this, such as calling one table group at a time to the carpet. As the year continues and students demonstrate their responsibility, they are able to be called to the carpet as a whole class. Transitioning from the Class Meeting Area Back to Their Desks: One of my favorite ways to help them get some energy out as they transition is through our STOMP Game. STOMP is incredibly easy and adaptable to so many academic review topics. For example, we can practice our spelling words with STOMP. Students will stand at the carpet and wait until I say the word. Then they will stomp in unison to each letter and freeze once they have spelled the word. We keep spelling words until all students have made it back to their desks. We also play Syllable Stomp (where - you guessed it - we stomp out syllables of words) and Fact Family Stomp (where we stomp out the number sentences that make up our Fact Family of the Day). STOMP is a fun way to review academics and gives students the opportunity for physical movement. 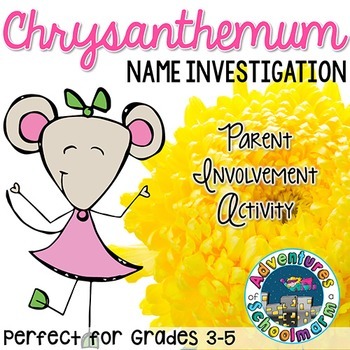 It can also be played as they transition from any space in the classroom to another! Transitioning from One Center to Another: In my classroom, using a TIMER is the key to successful transitions between centers. I love to use the timer on my phone. I also love the app 30/30. You can set up a specific routine, such as 20 minutes in a center with a 3-minute transition. The app will cycle through the times that you set up and send an audible notification when it is time to rotate. Students will need very explicit directions on what is expected of them when the timer goes off as well as time to practice it successfully. With consistent training and accountability, I have found that kids really respond well to the 30/30 Timer app! 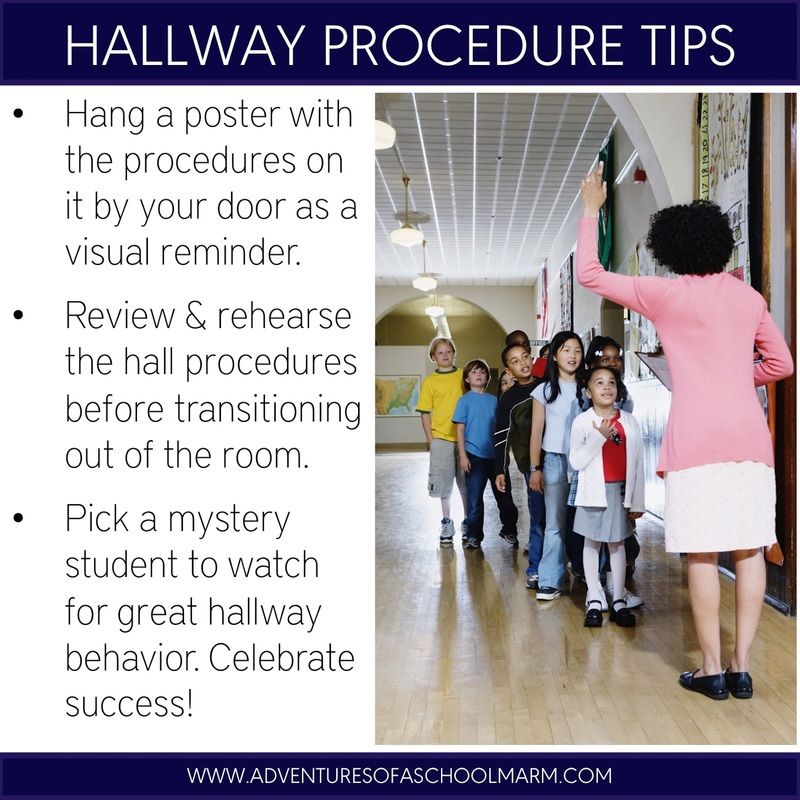 One routine that can be easily overlooked is the procedure for when students are in the hallway. Your class may be transitioning from room to room, walking to the cafeteria, waiting in line for the bathroom, or other situations, but they will definitely be spending time in the hallway. Most schools require students to walk in the hallway in quiet lines. Some schools even have lines painted on the floor that students are expected to stay on as they walk. There are a lot of variations on hallway procedures, but I have always kept it pretty simple. Whatever you decide to do, it is helpful to hang a sign by the door as a visual reminder. It is also helpful to rehearse those procedures as you leave. Establish if your school has school-wide hallway procedures already in place. If so, you will need to know exactly what they are so you can also teach them to your students and hold them accountable. Every school I have worked in has had school-wide hallway procedures, so I just needed to learn them myself and enforce consistently. Establish if your grade-level team has hallway procedures already in place. If your school doesn't require everyone to follow the same hallway procedures, then check with your teammates to determine if they have them. There is no need to reinvent the wheel if your team already has a system that works! Decide on your own hallway procedures if your school and team do not already have them in place. I have seen a variety of acronyms for different hallway procedures over the years. I personally prefer not to use any special "tricks" to get kids to behave in the hallway. Rather, I like to focus on helping students learn the purpose behind appropriate hallway behavior. I think once students understand why we want them to walk quietly, keep their hands to themselves, and look forward while they walk, they will be more inclined to meet those expectations. Lunch is another time of day that can be really stressful at the beginning of the school year. I suggest packing a lunch you can eat quickly that doesn't need microwaved. You will likely spend part of your lunch helping students learn cafeteria procedures, so you want to have something that you can eat quickly that doesn't require a lot of preparation. The following is a list of questions to ask your team members or school administration before the first day of school. The answers to these questions will determine what kind of procedures you need to put in place. Also, be sure to check with how your team mates do things. 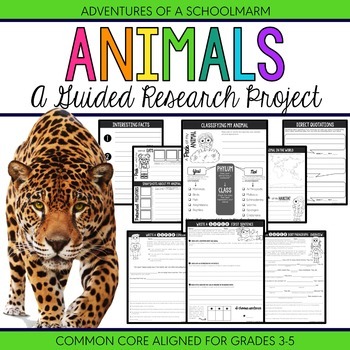 Sometimes designing procedures is just as simple as asking your team what the expectation is, learning the procedure yourself, and teaching it to your students. Do I need to take lunch count? If so, what time does the count need submitted? How do I submit the count? What do I do if a student comes in tardy? Do I need to adjust the lunch count if they are buying school lunch? 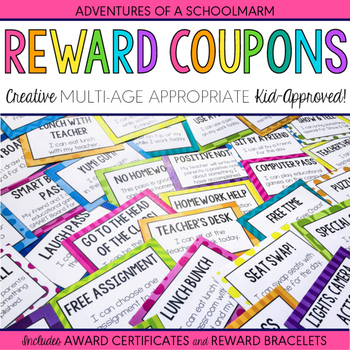 Do students have lunch codes? If so, do they punch their code into a specific number pad? What is the procedure for when students do not bring a lunch, but they also have no money to buy lunch? Can students pay more into their accounts? How will parents be notified when their lunch accounts are low? Do students have assigned seats in lunch? If so, does it follow a specific pattern (boy-girl) or can students choose their assigned seats? What are the procedures for entering and exiting the cafeteria? Plan time for students to learn their lunch codes. In my current school district, 100% of our students receive free lunch due to the high poverty nature of our district. As a result, we do not have to take lunch count. 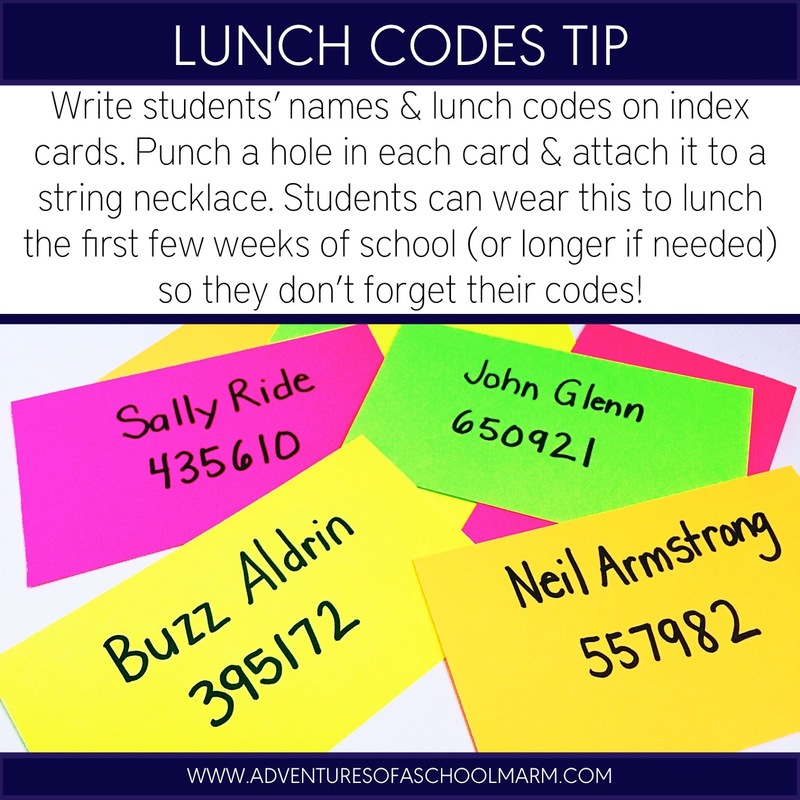 However, our students are required to punch in a specific lunch code as they pick up their lunch. The students often forget this code over the summer. We also have a very high mobility rate, so there are a lot of students transitioning in. For this reason, I specifically plan in the morning for the entire first two weeks of school to practice our lunch codes. I copy a key pad that looks just like the number pad they will use to log their code and give students time to pretend they are punching in their codes. They can quiz each other at their tables and make it into a fun game. Play it safe - Let students carry their code with them on an index card. I also don't take chances because even after a lot of practice, students will forget with they get to the cafeteria! I write each student's name and lunch code on an index card. I punch a hole in the card and attach it to a string to wear like a necklace. The first two weeks of school, I pass out their lunch code necklaces as we line up for lunch so they always have it with them. This has really helped them learn their codes and always be prepared. We have to keep the lunch ladies happy! They work hard to feed us well, so we can show them how much we appreciate them by being well-prepared. The end of the day is a source of a lot of stress for new teachers. 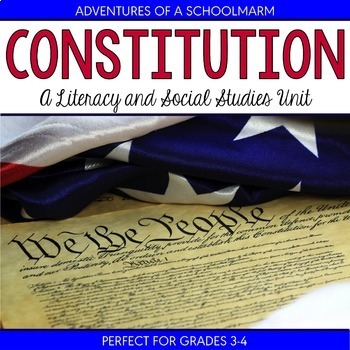 Tonja shares her strategies for helping students pack their book bags, clean up the room, and line up for dismissal in her post, so be sure to click through at the bottom of this post. I am focusing specifically on dismissal time, when the bell has rung and it's officially time for kids to go home. I shared in my post about 10 Things I Wish I Knew My First DAY Teaching that kids don't always know how they are getting home. Make sure to spend time at the beginning of the year checking in with students about how they will be getting home. I like to keep a student roster, then mark with a code how they will be getting home each day, such as these Student Transportation Forms. 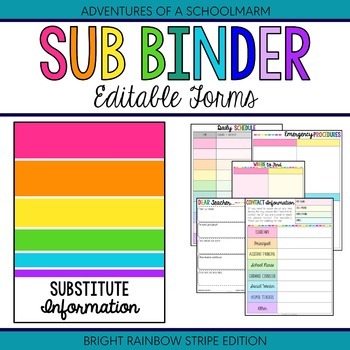 This is also really helpful information to include in your Substitute Resource Binder OR your Teacher Planner. I like to review this information as we are lined up for dismissal. I also keep this transportation list with me on my clipboard as we exit the building every day. The following is a list of questions to ask your team members or school administration about dismissal time before the first day of school. The answers to these questions will determine what kind of procedures you need to put in place as students are dismissing. I recommend writing the procedures out very specifically and keeping them with you on your clipboard. You have so many things to remember, so having it in writing will help you feel so much less stressed! Do we have school-wide procedures for dismissal? If so, what are they? Are all students dismissed at the same time? Or are students dismissed in waves, such as car riders first, then bus riders? Do I have to take my students to a specific location for dismissal? Do I have to keep a record of which adult picks up my students each day? What do I do if no one picks up one of my students?